At first glance you barely notice them, but they are there if you look more closely. Near stations, in pedestrian areas, shopping centres, places of interest, churches, town centres, parks and in public places. Their clothes are a bit grottier, their faces more weather-beaten. They seem more depleted than the rest of us, sometimes they have alcohol, sometimes other drugs. Who are we talking about? Germany's homeless population. Sometimes they beg. Some of them passively, sitting on the ground holding up a sign. Others are more active, approaching passers-by and asking if they have, "a euro to spare". Those who feel less brave just ask for a few cents. Or they sell something, mostly one of the many street papers you find in Germany's towns and cities. The Federal Association for Help to the Homeless (Bundesarbeitsgemeinschaft Wohnungslosenhilfe e.V. ), which is based in Bielefeld, puts the number of people living on the streets at 20,000 to 30,000. Nobody knows the exact figure. From time to time there are calls for more exact figures. But who wants to comb the streets and houses counting all the homeless people? They sleep in attics or cellars of large blocks of flats, on building sites, in parks and in public places, they look for hiding places in intricate disused sites, on railway sites, in derelict houses and ruins, under bridges, on university campuses. And yet they are just the tip of the iceberg. The overwhelming majority stay – or live – in emergency accommodation, centres for the homeless, cheap bed and breakfasts, refuges, hostels, institutions, or on the floor of friends, acquaintances or relatives, often merely tolerated, often just temporarily. According to a definition by the German Association of Cities, someone is homeless when they do not have their own living quarters assured by a tenancy agreement. This means someone is homeless for a certain period of time when, for example, they temporarily live with relatives or friends. This definition also includes people who stay in hostels, institutions, emergency accommodation, refuges or women's refuges because there is no settled housing available to them. According to estimates by the Federal Association for Help to the Homeless in Bielefeld, approximately 345,000 people in Germany were homeless in 2004. About 55 % of them were men, about 23 % women and about 22 % children and young people. A study from Hamburg from 2002 revealed that homeless people only have a realistic chance of returning to secure accommodation for good within the first six months after becoming homeless. For everyone else the following applies: the longer they are homeless, the less chance they have of escaping this situation, which just reinforces their plight. There is no fundamental right to housing laid down in Germany's Basic Law, as some interest groups call for. One of the main arguments for not introducing such a basic right was that homeless people might then get the idea of taking the Federal Republic of Germany to court to provide them with housing. And that, so the argument went, was not something the state could guarantee for each and every individual, and it should not, therefore, be anchored in Germany's Basic Law. Germany is an affluent nation. From the point of view of average income at least. Any yet there is a downside: more than five million employable people in Germany had no work in February 2006. The German Institute for Economic Research estimates that 1000 jobs are irretrievably lost every day. For every three new businesses set up one goes bankrupt. The problem of consumer debt in Germany is also becoming more acute. The rate of property ownership in Germany compared to the rest of Europe is still low at 30 %. The overwhelming majority of Germans have to rent their housing, for which they pay roughly a third of their income. Public housing stock has been largely dismantled in recent years and an amendment to tenancy law has eroded the rights of tenants. At the same time, demand for housing is growing: the amount of living space required per individual is constantly rising, as is the number of single households. People's expectations of housing are also increasing, with central heating, bath and toilet, hot and cold running water, telephone, cable and Internet connection considered standard requirements these days. In addition, the Wealth and Poverty Report of the Federal Government in 2005 shows that social differences have become exacerbated and social inequalities have increased in recent years. Against the backdrop of these underlying conditions, the loss of one's own home is not the cause of homelessness; but the final, visible manifestation of a course of events. Losing one's job, relationship crises, divorce, debts, addiction, mental health problems and illnesses, family conflicts, domestic violence, financial difficulties and other events are not first and foremost individual deficits, but decisive stages on the path to homelessness. They are also stages that make it clear how closely intertwined the process of social exclusion and individual behaviour patterns and ways of coping (very often underdeveloped skills for solving problems in difficult circumstances) are. The loss of one's home is therefore the final stage in a long process of the social and individual (re)production of poverty and homelessness. Help from individuals mostly comes in the form of some change or something to eat for someone begging on the street. Many people do this, but not all. Some citizens organise themselves into associations that collect food and clothes to give to those in need, cook and hand out meals or organise emergency night-time accommodation and day meeting points – especially in winter. This strategy rarely alters the state of homelessness, but it is a way of helping homeless people survive. The provision of accommodation by local authorities (the state) originates from a desire by the state to know where its citizens are, with people wandering around with no fixed abode considered a security risk. For a long time it was considered as constituting a crime. Thus legislation was laid down in Germany at the Länder level obliging the authorities to prove allocation of housing for homeless people whenever these had applied for housing assistance. But the standard of the housing for homeless people leaves a lot to be desired; it is often marginally situated, shared accommodation (with several people in one room) with common rooms. The residents have no rights like tenants do and they often live in mass living quarters. The result of this strategy is that homeless people are turned into the ‘hidden homeless'. They do not have to sleep rough. But some homeless people reject this sort of accommodation and choose to stay on the streets. Government aid is granted upon application via welfare agencies in accordance with social security legislation. Applications are usually submitted by establishments that wish to provide help for the homeless in this form. 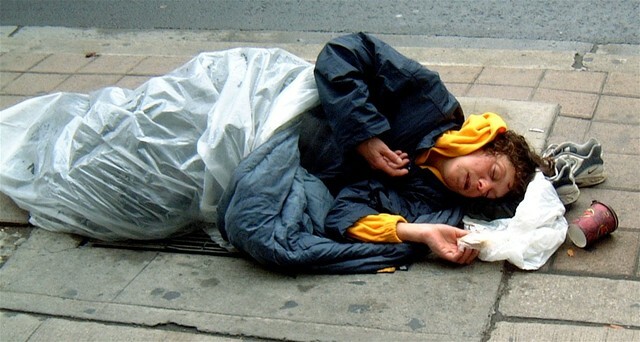 However, the assistance comes with the condition that the homeless citizen provides very precise information about his/her personal life circumstances, problems and life history. Regardless of whether one considers this reasonable or not, there are many homeless people who do not want to supply such information, are afraid that something unpleasant from their past background might come to light, or simply find that this invades their private sphere too much and choose to stay on the streets as a result. The other side of the coin is that any homeless person can use these facilities if they are prepared to accept the way the organisations work. This strategy of providing assistance based on social security legislation means that in addition to a roof over their heads homeless people receive advice and support specifically for their situation, the aim of which is to help get them back into settled housing. And many do, indeed, manage to rent and move into a flat of their own. The problem of being without a home is then solved for the first instance. But experience has shown that this is when the real difficulties begin. Very often it is not possible to join the world of work: with such a high rate of unemployment homeless people suffer from unequal access to participation possibilities in a variety of ways. Reintegration into the community also rarely succeeds because the provision of housing rarely take this criterion into account and homeless people are more or less forgotten in German cities' community and neighbourhood activities. Additionally, follow-up support after placement into housing is substantially underdeveloped with the result that many homeless people turn up again at the homeless organisations a while later. A new cycle begins and the plight of the homeless people becomes ever more inescapable. Exclusion and removal by legal means has become a growing phenomenon in recent years. The homeless are unwelcome in shopping streets and shopping centres, on public streets and squares, at stations and tourist offices. They are considered damaging to a city's image and therefore its economic potential. Some cities try to introduce instruments for keeping homeless citizens away from these places, sometimes in a roundabout way, sometimes quite blatantly. There are street by-laws, for example, that ban the consumption of alcohol in public places. The increasing privatisation of public spaces also means that private sector facility operators can issue house rules which forbid people from begging, drinking alcohol, sleeping or merely sojourning there. This strategy does not do anything to change the fact that these people are homeless either. It merely hides them. They withdraw to the city outskirts, mostly to areas already heavily afflicted by social problems. Last but not least, homeless individuals are victims of violent attacks and assaults again and again. 143 people died as a result of such attacks between 1989 and 2005. Real integration of homeless people into the heart of society is only minimally successful. The majority of the strategies that aim to help homeless people do not actually alter their state of homelessness. Rather, they make sure that the homeless are less noticeable, that they do not disrupt the public order, and that they can physically survive, i.e. that they do not starve nor freeze to death. These strategies merely improve their circumstances, they do not change them. At the moment other issues take centre stage in Germany: globalisation, the European integration process, demographic change, bird flu, fear of terrorist attacks by extremists, a new energy crisis looming. The people and organisations working for the interests of homeless people are on the defensive at the moment. They have enough of a fight on their hands just making sure that situation for helping the homeless does not get any worse. On top of that, the fear of sinking into poverty has now penetrated parts of Germany's middle class. Whether or not this fear is justified, it is also worrying because of a parallel phenomenon: the first interim results of a representative 10-year cross-section study on the subject of "Group-related Misanthropy" carried out at the Institute for Interdisciplinary Research on Conflict and Violence (IKG) of the University of Bielefeld and directed by Professor Wilhelm HEITMEYER, show that rejection of homeless people is spreading and intensifying at the moment. In other words, more and more people are of the view that homeless people in the cities are unpleasant, that begging homeless people should be removed from pedestrian areas and that homeless people are themselves to blame for being unwanted. There is therefore every reason to worry that the general consensus in German society that victims of social exclusion should, at least in principle, be accepted and allowed to participate in society could crumble in the next few years. Is Director of a self-help project in Berlin called mob - obdachlose machen mobil e.V. (homeless people mobilize), publisher of the Berlin street paper strassenfeger, scientific researcher on homelessness, self-help and poverty and has published of numerous publications on the subject including a dissertation entitled Wohnungslosigkeit & Subjektentwicklung. Biografien, Lebenslagen und Perspektiven Wohnungsloser in Berlin (Homelessness and subject development. Biographies, life circumstances and prospects of homeless people in Berlin).